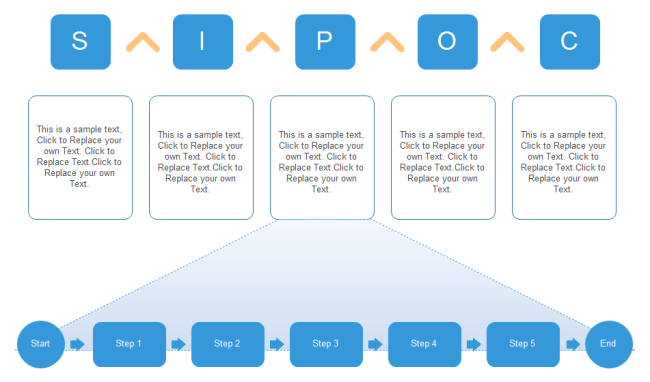 Why to Use SIPOC Diagrams? 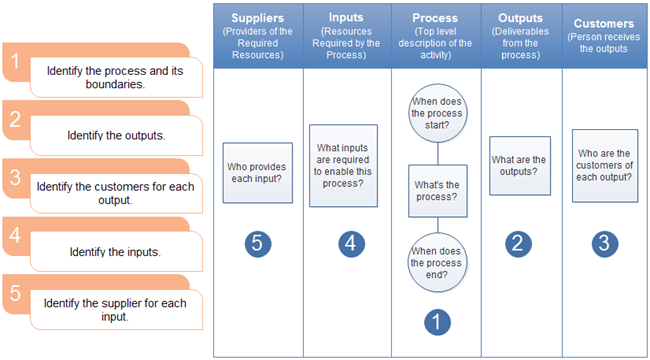 What are the activities involved for the process to transform inputs to outputs? What're the key inputs needed for expected outputs? Who're the true customers of the process? What're expected outputs of the process? When to use a SIPOC Diagram? Once the process management or improvement activity is underway, you should consider using SIPOC since it's important to get a high-level understanding of the process's scope first. When starting a new process or business, a SIPOC diagram is essential for giving people a high-level overview. For existing business, it helps reacquaint people whose familiarity with a process has faded or become out-of-date due to process changes. SIPOC is best accomplished in team work and brainstorming sessions. To conduct a successful SIPOC session, first provide participants a brief overview of the SIPOC process, purpose, tools/templates, and especially the keys to an effective SIPOC. The easiest method is applying a ready-made SIPOC template rather than draw it by hand. To best fit your own specific needs, perhaps you need flexible templates that are available to modify. Edraw is an easy-to-use SIPOC maker coming with a variety of SIPOC templates with different designs, all in vector format. You can easily change the box size, arrange the format and customize the SIPOC diagram with only a few clicks. Besides, abundant built-in symbols and illustrations are free in use to enrich your chart. Just take a pre-made template then forward your work. To apply a ready-made template, please click Diffrent Templates for Diversified SIPOC Design, or discover more templates on the Templates page, Flowchart category, Process section. 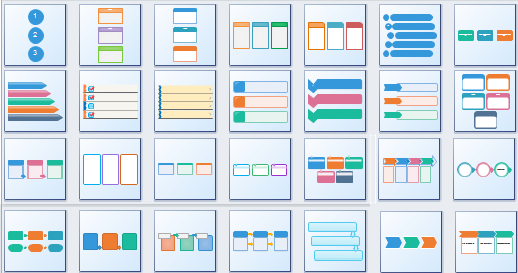 To design a SIPOC chart on your own, simply open the List and Process library in Edraw, and make a SIPOC diagram instantly from a large collection of pre-made shapes. Or you can use a cross-functional flowchart to represent your SIPOC diagram. Now identify each of the components for the whole process and fill in your chart. Process: Usually you start with process step first. It is a high-level process map with no more than 7 steps. It should define the activities of how you convert your inputs to outputs. Make sure the team approves with the representation of the process. Use a Verb + Noun format for the process steps. Such as "Add Source" or "Deliver the Goods". Outputs: For a process that produces a product, the primary output is obvious to identify. While for service-oriented processes outputs may be less apparent. Outputs of the process don't just include the product or service you are delivering, they can include paperwork, approvals, data, and just about anything else you can think of that results from your process. If you have a lot of outputs, focus on the critical ones. Customers: These are the recipients of each output of your process. Every output should have at least one customer. Better to match the customers to the outputs. Inputs: Determine what you need to produce the outputs. Inputs can include materials, people, machines, IT systems, information, or anything else that is necessary for the process to run. Brainstorm and capture the crucial ones under the Inputs column. Suppliers: Identify who supply you inputs. Document the suppliers of each input under the Suppliers column. It visually depicts which suppliers provide which inputs. Be concise, complete on one sheet of paper, as it's a high-level overview. An effective SIPOC diagram tool will help you end up with a presentation quality diagram quicker.